Phyllis Carol Barrett, born 11/09/21, died at the age of 97 years young. She was a lifetime resident of Great Falls. The Funeral Service will be held on Friday, December 7, 2018 at Our Savior’s Lutheran Church, 1326 1st Ave N, Great Falls, at 11:00 a.m. The Graveside Service is scheduled for the same day, at 1:00 p.m. at Highland Cemetery. 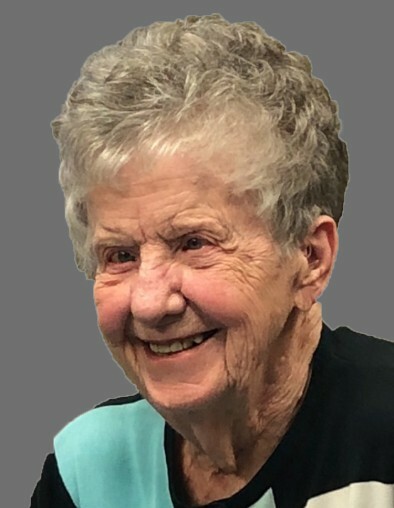 Phyllis went to grade school at the Old McKinley Elementary School, then attended Paris Gibson Junior High, and graduated from Great Falls High School in 1939. She married the love of her life, Edward H. Barrett, on April 27, 1941. They were married over 50 years, until Ed’s death in 1998. Phyllis worked at the control counter at Littles Lanes for 43 years, retiring on her 80th birthday in 2001. An avid bowler, she was a member of the National 600 Club and was inducted into the Hall of Fame as a Star of Yesteryear in 1997. Phyllis spent many fun-filled summers in Whitefish, Montana. She belonged to the Whitefish Golf Course for over 25 years and scored a “hole-in-one” two times, one legal. She also loved boating and waterskiing on beautiful Whitefish Lake, where she and Ed had a cabin, and then a condo, at Bay Point. She last took her O’Briens for a loop around the lake when she was 80 years old. Phyllis had her first pet, a golden retriever named Zoey, at the age of 96. Zoey stayed by her side until her last days. Phyllis is survived by her two granddaughters, Corinna (John) Lain of Richmond, VA, and Amanda Barrett of Sudbury, VT; two great granddaughters, Julia and Jessica Lain; a nephew, Tom Sorenson (Celia) and his family; a niece, Mary (Lance) Prudent and her family; and her first and only pet, Zoey. She was preceded in death by her husband, Edward Barrett; her son, Bruce Barrett; her daughter, Judy Barrett; her 4 siblings, Edith Mullins, Larry Strand, Philip Strand (her twin), and Joyce Sorenson; and her parents, Lawrence and Agnes Strand. In lieu of flowers, please consider a donation to Peace Hospice at 2600 15th Avenue South, Great Falls, MT 59405.